The Stilt Sandpiper is a more common migrant in the fall than in the spring in Tennessee, and in non-breeding plumage, it resembles a small Lesser Yellowlegs. This species breeds in the Arctic of North America, and winters primarily in the interior of central South America. 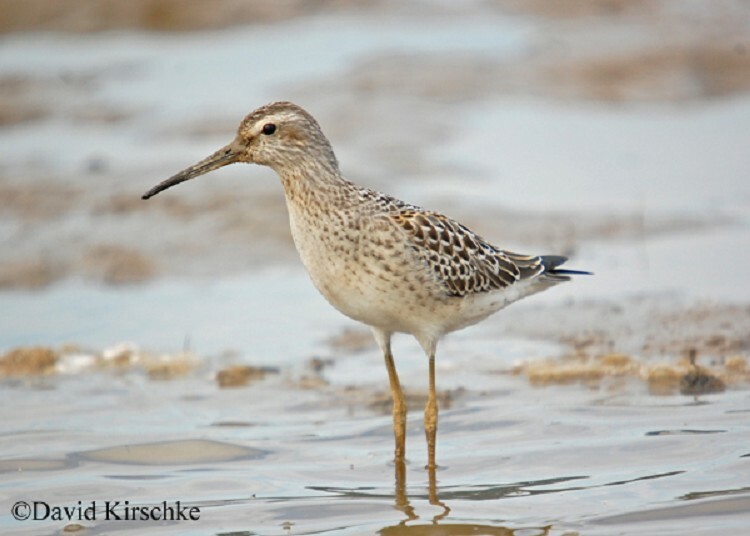 The Stilt Sandpiper can be found statewide, but is more frequently encountered in Middle and West Tennessee from late April to late May, and then again from mid-July to mid-October. Description: This medium-sized sandpiper has long, greenish legs, a long neck, and a long bill that droops slightly at the tip. In flight the wings are plain, the rump is white, and the tail is gray. Breeding plumage (April-August) is distinctive, with heavy barring below, dark blotches on the back, and a reddish cheek-patch. Non-breeding plumage (September-April) is basically gray above and white below. Immature birds (July-September) are similar to the non-breeding adult, but have a browner scaly back, and thin streaks on the chest. Voice: Call a low, soft toff. Nonbreeding Wilson's Phalarope has entirely white below, with a thinner, straight bill, and more active behavior. Lesser Yellowlegs is larger, has a mostly white tail, and bright yellow legs. Dowitchers (short-billed and long-billed) have shorter legs, longer, straight bills, and a white triangle extending up the back. Habitat: In Tennessee, Stilt Sandpipers use exposed mudflats, the edges of lakes and ponds. Status in Tennessee: The Stilt Sandpiper is a rare spring migrant and uncommon fall migrant found across the state, but more frequent in Middle and West Tennessee. In spring it is most likely encountered from late April to late May, and then again from mid-July to through October. The first state record for Stilt Sandpiper in Tennessee was in 1934, in Shelby County. As with many shorebirds, the Stilt Sandpiper's fall migration happens in several pulses beginning in July with adult females, followed by adult males, and finally by juveniles. Klima, J., and J. R. Jehl, Jr. 1998. Stilt Sandpiper (Calidris himantopus). The Birds of North America No. 341. (A. Poole and F. Gill, eds.). The Academy of Natural Sciences, Philadelphia, PA, and The American Ornithologists' Union, Washington, D.C.